The Footcursor is a foot-operated mouse designed for use by individuals with limited upper extremity mobility, upper extremity disabilities, repetitive stress injuries, or cumulative stress disabilities. 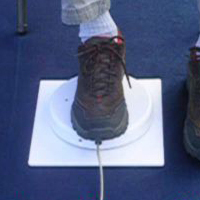 Usable with either foot, this device enables the user to perform cursor movement with a foot. The Footcursor consists of a square plate base with a moveable round plate which sits on top of the square surface. An embedded microchip detects movement of the user's foot on the the round plate and translates it to the cursor's movement on the computer monitor. For example, when the round plate is moved to the right, the cursor moves to the right, and when the round plate is moved toward the user's back, the cursor moves down. The Footcursor has an input jack which allows a single switch to be attached for performing a left or double click action. The Advanced model also incorporates the ability to perform mouse clicks - to perform a right click users lift the front part of the foot and leave the heel on the Footcursor Advanced Version. For left clicks, users lift the back part of their foot and leave the front part on the Footcursor Advanced Version. Users also can do double-clicks and drag-and-drops (learning and practice is required). The Footcursor can be used in conjuction with other pointing devices as well as USB footswitches. We cannot offer a warranty or our 30 day CSG on this product, and the manufacturer is no longer in business. We are testing each item before it ships to ensure it is fully functional.